The Slaves of the Immaculate Heart of Mary have a profound interest in supporting lay Catholic communities associated with our religious houses. There is presently one such community formed around Saint Benedict Center, our apostolate in rural southern New Hampshire. What is a Catholic community? It’s a place where the theological and moral virtues are the accepted standards of behavior in private, family, professional and social life. It’s a place where individuals and families can be sanctified, vocations may be realized, and tomorrow’s saints may be formed. Simply put, it’s a place where one can live one’s Faith with gusto! In the late 1980’s, our lay community formed around the monastery and convent in Richmond, New Hampshire. Within 5 miles of the religious houses, there are approximately thirty households of associated lay faithful, many of whom live within walking distance of daily Mass. Others live in surrounding towns. The traditional Roman Rite Mass lies at the heart of the community. 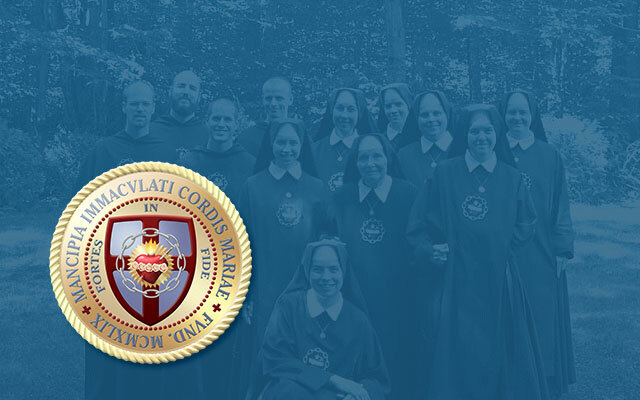 The Slaves of the Immaculate Heart of Mary provide priests to support this apostolate. The members of our community have never been deprived of the Holy Sacrifice of the Mass on a Sunday or holy day of obligation. In fact, they presently have daily Mass without interruption. In addition to providing for its sacramental life, the Congregation supports the lay community by running a primary and secondary school. Operated by our sisters, Immaculate Heart of Mary School was started in 1990 with uncompromising allegiance to Catholic orthodoxy and a firm resolution to counter the demonic influences of our day. Assisted by Third Order leaders, the religious also engage in other youth apostolates designed to keep our young people committed to living their faith, avoiding the nefarious influences of the world, and growing in virtue. Our brothers conduct regular evening programs for the community on adult catechesis, philosophy, and Holy Scripture. They also lead monthly mens’ meetings concerning cultural and moral matters affecting the lay community as a whole. Religious community facilities include a chapel, monastery, convent, school, bookstore, print shop, and multi-function hall. The hall is used for IHM School events, community brunches, and talks which follow Mass each Sunday, as well as for community plays and occasional feast day celebrations. Many Third Order Slaves and supporters would like to relocate to our community. The challenges are great, but for traditional and uncompromisingly orthodox Catholics, it’s an ideal place for singles, newlyweds, families and retirees. It is our vision that, with the continued growth of our congregation of religious brothers and sisters, this reality will be multiplied across our nation as new monasteries and convents become oases around which family and community life will flourish. You are invited to find out more by contacting us, or by making a personal visit to Richmond.